In a large Dutch oven or heavy pot, heat oil over medium-high. Season chicken with salt and pepper. Working in two batches, brown chicken, 3 to 4 minutes per side. Transfer to a plate. Reduce heat to medium. Add onion, garlic, cumin, curry, thyme, and 1/2 cup water and season with salt. Cook, stirring occasionally, until onion has softened, 3 to 5 minutes. Add carrots, coconut milk, 1/2 cup water, and chicken with any accumulated juices. Bring to a boil. 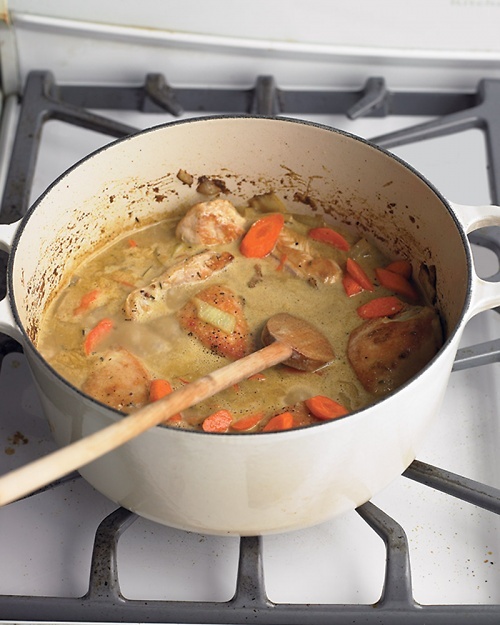 Reduce to a simmer, cover partially, and cook until chicken is cooked through and carrots are tender, about 10 minutes. Remove from heat and stir in peas. Serve curry over rice.